The Nigerian Ports Authority (NPA) will welcome more Canadian firms to take advantage of the numerous investment opportunities presented by the successful reform of the Nigerian port system. 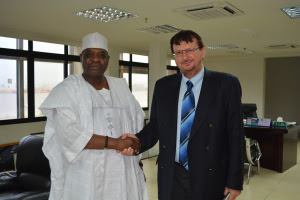 The Managing Director, NPA, Malam Habib Abdullahi made this call on Wednesday during the visit of the High Canadian Deputy High Commissioner to the Corporate Headquarters in Marina Lagos. Abdullahi said that even though at present the NPA had a contract relationship with a Canadian firm handling the proposed 25 years Port master plan and some ICT projects, he would want Canadian firms to show more interest in Green Field port development and Capacity Building in Marine related courses to meet International standards. The Managing Director said that the NPA is committed to the 25 years port master plan and would want the Canadian firm handling the plan to urgently conclude it as it will chart a course for the future of the port industry. In a press statement by the General Manager, Corporate Affairs of the Authority, Capt. Iheanacho Ebubeogu, the NPA boss took advantage of the visit to invite both local and foreign investors to the ports as the Nigerian economy is vibrant, attractive and robust. On his part, the Deputy High Commissioner Mr Lajos Arendas expressed delight at the visit having just taken over the responsibility and said that his mission was to further improve the already existing relationship with Nigeria. According to him, Canada plays host to many Nigerian students and that the visit has posed more challenges to him to seek for more ways to attract Canadian firms into the port industry as the commendable infrastructure development in the ports will attract investments. The Deputy High Commissioner was accompanied to the visit by Sylvia Koleva and Sarah Branco both trade commissioners.